The Disney Afternoon was a two hour block of animated shows that aired from 1990 until 1999. From 3:00pm until 5:00pm (or 4:30 pm from 1997 through 1999) on weekdays children and Disney-minded individuals could follow the exploits of Scrooge McDuck, Goofy, Tummi Gummi, Chip, Dale, Gadget, Drake Mallard, Aladdin, and countless others. To say that The Disney Afternoon was a staple in my house would be an understatement. There were times that my sister and I would catch Animaniacs or Tiny Toons, but with the exception of Batman: The Animated Series, nothing came between us and Baloo and Kit and the rest of the Disney created toons. In fact, I was known to create my own Darkwing, “I am the terror…” lines and a Rescue Rangers’ Chip stuffed animal sat on my shelf, covered in dust, until long after I left home. 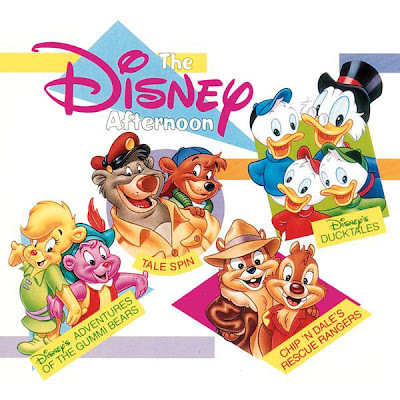 In January of 2008 The Disney Afternoon Songbook was released on iTunes. It not only included the theme songs from DuckTales, Gummi Bears, Chip ‘n’ Dale Rescue Rangers, and Tale Spin, but the album also comes complete with songs from individual episodes of the shows including Monkey in Your Tank from Tale Spin, Gummiberry Juice for Disney's Adventures of the Gummi Bears, and Boogie Beagle Blues from Duck Tales. It is a great way to relive a few moments of your childhood, or a few moments of afternoon cartoon goodness. For those weary of purchasing songs that they are not as familiar with as the shows’ theme songs, the themes are available for purchase individually. The original album was released in 1991, which explains the lack of music included in later shows, and leads me to my one complaint. The collection would have been better served with an update to include shows like Darkwing Duck and Goof Troop. Otherwise, it offers just enough nostalgia to put a smile on my face. For those curious about when, and at what time, their favorite Disney Afternoon shows aired, you can find the complete schedule below. Darkwing Duck is my favorite Disney cartoon EVER (second is Aladdin) Thank you. This post made my day.